Bostoned wrote: Spec-ops is selling a few versions of The Pack for a deep discount right now. One for $63 and two others for $56. It would be really considerate to post at least a product link if not photos or information to better explain what this is and why it is a deal. And I don't see any great deals on their site. Looks like the only deal is for the ACU pattern. Gross. Still a great price though. BobtheBreaker wrote: Paramedics must have been pissed! trying to lift that guy onto the gurney with his massive brass stones weighing everything down. Heks wrote: engagement ring.... is that a MOLLE accessory? LA Police Gear is having another sale on the Aimpoint Pro optic. MSRP is $485 other legitimate websites have the for around $440. LPG has them for $379 but it's this weekend only. In my opinion on of the best red dots for the money. W/ $50 mail in rebate only $300 - enough for an entire Saturday of shooting. That is a whole weekend for me. Old age has slowed the magazine reloading of yesteryear. Sleeping bags, pads, accessories on sale here. Also, you can take 10% off if it is your first order. Much of it appears more Gucci than I am accustomed to but I have purchased from this site before with success. Thought I'd share. Where I live, the time that you would crawl into a sleeping bag outdoors is approaching. Last edited by moab on Fri Oct 27, 2017 7:15 pm, edited 1 time in total. Thought I would pass this along to my ZS brothers and sisters. Available in many calibers. A $100 rebate gets you to $349. Can anyone tell me the difference between this and the Axis XP? Both have the accutrigger. Can't find anything else on their site. I know this is a serious jump up in quality though from the Axis series. As they MSRP for about double almost. Bushmaster's QRC Quick Response Carbine Semiautomatic Tactical Rifle $339 is prepared for the range right out of the box. Features a 16" Superlight contour chrome-moly barrel with Melonite™ treatment for longevity and ease of cleaning. Hard-coat anodized receiver with protective coating is corrosion-resistant and stands up to the wear and tear of high-volume shooting with ease. Polymer M4 six-position collapsible stock adjusts to fit you perfectly. Primary Arms. 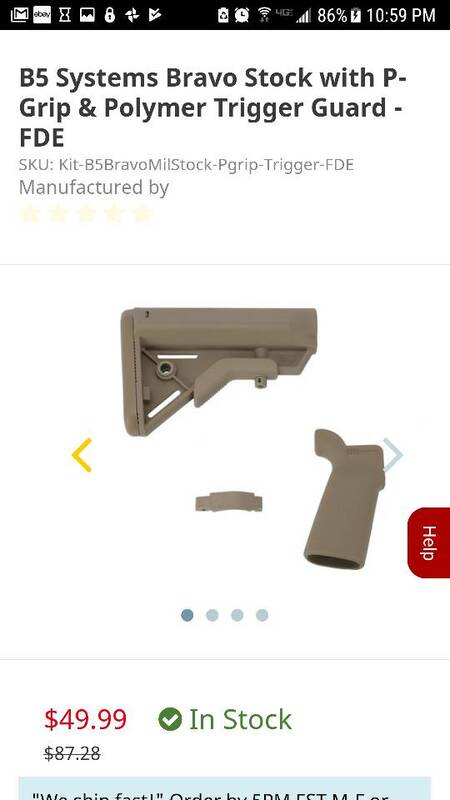 B5 Systems Bravo stock and their P Grip for $49. Seems legit for the stock and the grip. They had black too. This is one of my favorite stocks. Katadyn Hiker Pro Microfilter - $47.57 currently, ships free with Prime. An all time historic low per Camelx3. (https://camelcamelcamel.com/Katadyn-801 ... B002CN82V2) It almost never drops below $60. At the moment you can actually get it for about a buck less if you select the one sold by Ergotoes Products, a non-Prime Amazon seller. 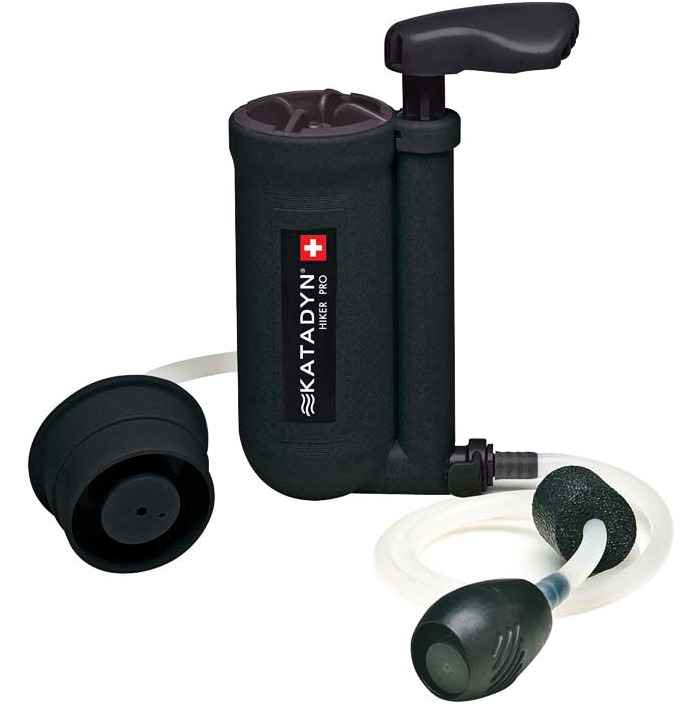 For those of you looking for something a bit more user friendly and less fussy than something like a Sawyer microfilter. majorhavoc wrote: Katadyn Hiker Pro Microfilter - $47.57 currently, ships free with Prime. Dang, killer deal. Only $5 more than buying just a replacement filter! Great find! Thank you! 'tis the season that is going to kill me. Amazon has 4 different models of Kershaw Blur for 34.99 [compare at 59.99] on their Deal of the Day today. And I have to buy a 4 piece kitchen appliance package this season. If you wish to stay happily married, absolutely DO NOT CLICK on the below link. Some good bulk ammo sales here, and they have a drawing for an AK give away. Larue is giving away 50 Ultimate AR-15 Upper Kits, 1 each day thru 24 December. Asymetryczna wrote: Some good bulk ammo sales here, and they have a drawing for an AK give away. Check in to TD everyday leading up to Black Friday! 3 new Door Buster items will be added each day at Rock Bottom Prices. Limit 2 per person. While supplies last. Blue Force Gear will be offering 20% off sitewide starting Friday, November 24 and ending at midnight on Monday, November 27. This offer will exclude the Custom Sling Builder, Micro Trauma Kit NOW! and clearance items. our ENTIRE store will be discounted 25% – 50% off. U.S. Tactical Supply will be having 25 % off select New 5.11 Products Both Instore and Online! • Rush LBD, Rush 12, Rush 24, and Flag Bearing Caps! We will also be having a store wide sale on other items you can visit us at http://www.ustacticalsupply.com and look for the 2017 Black Friday Sale Tab. And they’re going to run it Thanksgiving through Cyber Monday! High volume meets high velocity in the Federal Bulk .22LR Ammunition. The .22 LR loads feature 36-grain copper-plated, hollow-point bullets that fire at 1,260 fps for accurate, flat-shooting performance. Extremely reliable primer with clean-burning propellant. Comes housed in rugged metal ammo can. Perfect for the shooting range or small game.